– The 2017 WWE SummerSlam Kickoff pre-show opens with Renee Young welcoming us as fans start making their way into the Barclays Center. Renee is joined by David Otunga, WWE Hall of Famer Lita and WWE Hall of Famer Jerry Lawler. They send it back to Charly Caruso in the Social Media Lounge. She will be joined by Seth Rollins and Dean Ambrose later on. Fans can submit questions with the “#AskDeanandSeth” hashtag. Charly sends it back to the panel. Renee sends us outside to Sam Roberts, who is with a bunch of hyped up fans. Roberts plugs the WWE Network and fans chant “yes!” as Sam sends us back to the panel. They indicate that the actual pay-per-view will go past 11pm EST as there will be a “minimum four-hour” time for the show. They talk about tonight’s show and The Mae Young Classic when plugging the WWE Network. Renee shows us how Baron Corbin unsuccessfully cashed in his Money In the Bank briefcase last week on SmackDown. – We go backstage to Corbin and what looks like Kayla Braxton. Corbin says John Cena will regret what he did on SmackDown because Corbin is going to hurt him. They’re having some sound issues it appears. Corbin also botched his promo. We go back to the panel for talk on Cena vs. Corbin. We get a break and a promo for Finn Balor vs. Bray Wyatt. The panel discusses the match next. Lawler, Otunga and Lita all pick The Demon to win. We get a promo for tonight’s WWE United States Title match. We go backstage and Dasha Fuentes is with SmackDown General Manager Shane McMahon, who will be the special referee for tonight’s US Title match. Shane talks about things possibly getting physical tonight and says one thing he can guarantee – there will be a winner. We go back to the panel for discussion on the match. Lawler believes Shane will be a big part of the match outcome. Otunga and Lita go with AJ while Lawler picks Owens to win. Renee sends us to the ring. Michael Cole, Corey Graves and WWE Hall of Famer Booker T welcome us. WWE Intercontinental Champion The Miz is out first with Maryse, Curtis Axel and Bo Dallas as JoJo does the introductions. There are still a lot of empty seats as Cole shows us a large group of fans still waiting to get inside of the Barclays Center. Jason Jordan is out next, followed by The Hardys. They head to the ring together. Matt Hardy starts things off with Axel and they go at it. Axel takes it to the corner but Matt fights out. Jeff Hardy tags in for some double teaming with Matt. Jeff with Poetry In Motion. Jeff takes Axel back down and dropkicks him for a 2 count. Jason Jordan tags in but Axel gets the upperhand and in comes Dallas. Dallas works Jordan over but Jordan turns it around. Jordan with a dropkick for a 2 count. A “delete!” chant tries to get going as Jordan tags in Matt for a bit of double teaming on Bo. The babyfaces triple team Axel and Dallas. Jeff looks to keep it going on Dallas but Axel pulls him to safety. The Miztourage re-groups on the floor as we go to a break. Back from the break and Jeff is in control of Bo. Jeff with a dropkick for a 2 count. Bo blocks a Twist of Fate but Jeff comes right back. Jeff goes to the top but Axel knocks him off. Bo stomps away on Jeff now. Miz tags in and keeps the boots to Jeff. Miz with a running boot to the face and a 2 count on Jeff. Miz keeps control of Jeff and mocks Jordan, taking his time. Jeff kicks Miz away but Axel tags in and goes right to work on Jeff. Axel works Jeff over and drops a knee to the back before keeping him grounded. Jeff finally hits an inverted enziguri on Axel. Matt and Miz tag in now. Matt unloads into the corner. Matt with a clothesline to Miz and a bulldog, which also took out Bo. Matt also knocks Axel off the apron. Matt drops an elbow on Miz and covers for a 2 count. Miz blocks a Twist of Fate and goes for a Skull Crushing Finale but it’s blocked. Miz comes back and drops Matt for a 2 count. Miz with the “yes!” kicks to Matt now. Matt ducks the roundhouse and hits a Side Effect for a 2 count. Jordan and Axel come in next. Jordan takes control and unloads. Jordan drives Axel into the corner and tosses Bo across the ring. Jordan with more offense and a big throw to Axel for a 2 count. Bo drops Matt after sending Jason to the floor. Jeff makes the save but Axel tosses him to the floor. Jordan with a belly-to-belly on Axel. Miz tags himself in but Jordan didn’t see it. Miz grabs Jordan in mid-move for a Skull Crushing Finale and the pin. – After the match, The Miztourage celebrates as we go to replays. Miz raises the title and talks trash at ringside. There are still a lot of empty seats, especially at ringside. – We go back to the panel and get a look at the Social Media Lounge with Seth Rollins and Dean Ambrose getting ready. Back to another break. We come back to a video package for tonight’s RAW Tag Team Title match. We back to the Lounge with Charly, Ambrose and Rollins. Ambrose says he’s feeling really aggressive tonight, he’s in a mood. Ambrose says he and Rollins scorch everything in their way when they channel their energy in the same direction, and tonight the RAW Tag Team Champions are in the way. They’re asked what their tag team name is but Rollins says they don’t need a name but after tonight, you can call them the champs. Ambrose says coming up with a name can cause tension and they’re just focused on tonight, but he jokes that he does have a list of names that Rollins can check out later. Rollins expects it to be electric out there tonight. He says it’s cool to be fighting alongside Dean again. Ambrose says he’s feeling 100% confident. They talk more about tonight’s match before Charly sends us to ringside. We go to the ring with Corey Graves and Vic Joseph on commentary now. Neville is out first as Greg Hamilton does the introductions. We see how Neville recently lost the title on RAW. WWE Cruiserweight Champion Akira Tozawa is out next with Titus O’Neil. The bell rings and the “ah!” chant starts up. They lock up and Neville takes control. Neville drops Tozawa with a shoulder. Neville with more offense and an early pin attempt. Neville keeps control and lands a dropkick, yelling about how this is his ring. Tozawa comes back and dropkicks Neville to the floor. Tozawa says this is his ring as another “ah!” chant starts. Neville looks on from the floor as fans continue to find their seats. Neville takes his time getting back in but Tozawa runs over him and unloads in the corner. Tozawa keeps control, hitting a kick to the chest and a senton. Tozawa runs the ropes but gets sent to the apron. Neville drops Tozawa over the top rope and sends him to the floor as Titus looks on. Neville comes out and sends Tozawa into the LED board at ringside. We go to a break. Back from the break and Neville drops Tozawa with a dropkick. Neville goes to the top for another big shot for a close 2 count. Neville works Tozawa over and keeps him grounded now. Titus looks worried as he tries to rally fans for Tozawa. Tozawa fights up but Neville counters. Tozawa tosses Neville over the top rope. Tozawa runs the ropes and takes out Neville on the floor. Neville makes it back in first but Tozawa is right behind him, fired up. Tozawa with a big forearm in the corner, and another. Tozawa goes for another but Neville swings and misses. Tozawa with more offense before dumping Neville on his face. The “ah!” chant starts again as Tozawa goes to the top but changes his mind when Neville moves out of the way. Neville dumps Tozawa to the apron. Tozawa springboards in but Neville catches him on his shoulder. Tozawa turns that into an octopus submission in the middle of the ring. The hold is turned into a roll-up for a close 2 count. Tozawa comes right back with a Shining Wizard for a close 2 count. More back and forth now. Tozawa drops Neville with a big kick to the ear. Tozawa charges but Neville drops him with an enziguri. Tozawa with a hurricanrana and another big kick. Both cruiserweights are down now. Titus encourages Tozawa. Neville goes to work on the previously injured shoulder of Tozawa now. Tozawa counters and rocks Neville with a right. Tozawa with a boot next. Tozawa drops Neville with another right. Titus tells Tozawa to go to the top and he does. Neville jumps up and cuts him off. They trade shots up top. Tozawa blocks a superplex and sends Neville to the mat. Tozawa goes for the big senton but Neville gets his knees up. Neville goes back to the top as Titus yells at Tozawa to get up. Neville hits Red Arrow for the pin and the title. – After the match, Neville raises his title and stands tall as his music hits. We go to replays. Neville stands tall in the ring as Titus checks on Tozawa at ringside. – We go back to Renee and the panel for hour 2 of the pre-show. Peter Rosenberg has replaced Lita. We go backstage to Kayla and Roman Reigns, who talks about tonight’s main event. Reigns is very confident about becoming WWE Universal Champion tonight. We take a break and go back to the ring. – Elias is in the ring with a guitar and spotlight. He asks who wants to walk with Elias. He asks everyone to hold their applause until after he’s finished with his song. Fans start booing as he sings. Elias sings but the heat gets amped up. He pauses and says he told them to hold their applause. He goes on and sings the song, taking shots at New York City, Brooklyn and the people. Elias finishes his song and the spotlight cuts off but it sounds like fans want one more song. The spotlight comes back and Elias asks if we want an encore. He sings another song about Brooklyn, taking shots at Jay-Z, Biggie and hipsters, among others. – We go back to the panel and they’re interrupted by Carmella with James Ellsworth. Otunga leaves the panel while they’re out. Carmella raises the Money In the Bank briefcase as fans cheer. They talk about some of tonight’s matches and when asked if she will cash in tonight, Carmella says she’s not going to reveal any of her plans. They talk some more and leave the panel as Renee sends us to another break. We come back to The Singh Brothers introducing WWE Champion Jinder Mahal backstage. Jinder cuts a promo on tonight’s match against Shinsuke Nakamura and then speaks in Punjabi. Back to the panel for discussion on tonight’s WWE Title match. Renee sends us to ringside. Tom Phillips, JBL and Byron Saxton are on commentary now. We go right to the ring and out comes The Usos. SmackDown Tag Team Champions The New Day are out next. Kofi Kingston will watch from ringside as Xavier Woods and Big E defend. The New Day cuts promos on their history with Brooklyn and how they will win tonight. Jimmy Uso starts off with Woods and drops him with a shoulder. Woods ends up getting the upperhand by overpowering Uso. Woods drops him and stares at his brother before covering for a 2 count. Woods with chops in the corner now after taking Uso’s t-shirt off. Woods goes to the top but Jey Uso distracts him, allowing Jimmy to drop Woods in mid-air. We go to a break. Back from the break and Jey is in control now. Woods looks for a tag but Jey cuts him off. Jey whips Woods hard into the corner and he goes down. Uso takes Woods to the top as Big E cheers his partner on. Uso goes for a superplex but Woods resists and fights back. Woods headbutts Uso back to the mat. Jimmy runs over and tries to nail Woods but he hits the ring post instead. Woods with a dropkick on Jey but he can’t make the pin. Fans clap for The New Day. Woods leaps for a tag but Jimmy knocks Big E off the apron. Jey grabs Woods and dumps the back of his neck into the turnbuckles. Jimmy keeps control as Jey comes back in and they double team Woods for a close 2 count. Jey talks trash as we get a replay. Uso keeps Woods grounded now. Big E continues shouting words of encouragement from the apron. Woods looks to make another tag but Uso slams him. Woods finally slams Uso on his face off a counter. Big E finally gets the tag and unloads on Jey. Big E runs the ropes but Jey nails an enziguri. Big E catches Jey and drives him into the mat for a close 2 count. Big E ends up powerbombing Woods into Jey. Woods stands up with Big E on his shoulders and tosses him onto Jey for another close pin attempt. Big E and Kofi rally the fans. Jimmy with a close 2 count on Big E. The Usos double team Big E now and hit a big double spinebuster for a close 2 count. Jimmy with a big right hand and the Umaga splash in the corner. Woods tags in and hits Jimmy. The New Day with a big double team Backstabber but Uso still kicks out at 2. Woods with chops to Uso as they get to their feet. Jimmy cuts Woods off but Woods comes right back and unloads on him. Jey tags in but Woods doesn’t see it. Woods still takes Uso out and leaps to the floor for the other brother. Big E is left along in the ring. He runs the ropes for a dive but Uso kicks him in the head. The Usos roll Woods back into the ring and go up top for the double splash but Big E takes one of them out. Uso nails a splash but Woods kicks out at 2. Fans rally for The New Day now. Woods counters a move and applies a submission on Jey. Jimmy crawls in the ring but Big E grabs his leg and pulls him to the floor. Jimmy decks Big E. The submission is turned into a 2 count. Woods with a Shining Wizard for another close 2 count. Woods waits for Jey to get up, yelling at him. Woods knocks Jimmy off the apron as he approaches. Woods goes for the Honor Roll but Jey catches him on his shoulders. Woods gets the upperhand and tags in Big E. Woods with a big DDT to the floor on Jimmy. Big E scoops Jey on his shoulder and Woods goes to the top for the Midnight Hour but Jimmy breaks the pin up just in time. Fans chant “this is awesome” now. Woods knocks Jimmy out of the ring with a right hand. Jey launches Woods from the ring out to the floor and Jimmy catches him in a huge Samoan Drop on the way down to the floor. Jimmy launches Kofi into the steel steps. Big E spears Jimmy from the apron. Big E rolls Jey back into the ring and scoops him for the Big Ending but Jimmy tags in. They double team Big E with several superkicks. The Usos go to the top for the double team splash as Big E is down in the middle of the ring. They hit the splash and cover for the win and the titles. – After the match, The Usos celebrate and stand tall as we go to replays. The Usos leave with the titles as The New Day looks disappointed. – We go back to the panel for more discussion on tonight’s show and the rest of the matches. We see a KFC commercial with several WWE Superstars. The music of WWE Hall of Famer Shawn Michaels hits and out he comes into the Barclays Center dressed as KFC’s Colonel. Shawn dances around as his music plays and that’s it. We go back to the panel for more discussion on the rest of the card. Corbin vs. Cena will open the pay-per-view. We go backstage and Paul Heyman is about to be interviewed but he takes the mic and cuts a promo on tonight’s main event. Braun Strowman appears and tells Heyman he talks too much. We go back to the panel for talk on tonight’s main event. Lawler goes with Lesnar, Rosenberg goes with Reigns and Otunga goes with Braun. Renee wraps the pre-show. 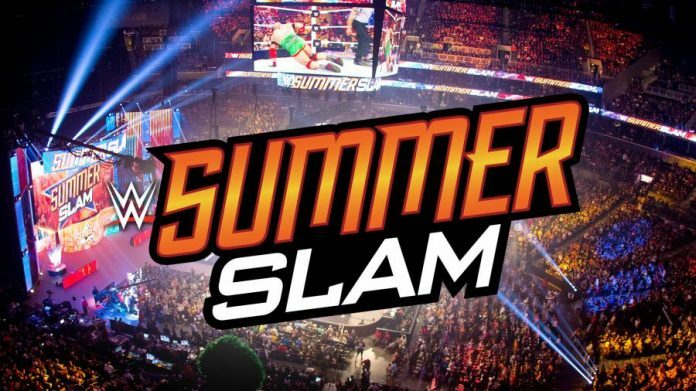 – The 2017 WWE SummerSlam pay-per-view opens up with a video package. – We’re live from a sold out Barclays Center in Brooklyn as Tom Phillips welcomes us. He’s joined by JBL and Byron Saxton. We go right to the ring and out first comes John Cena as some fans sing their own version of his theme song. We see some of the international announce teams at ringside. Baron Corbin is out next. The bell rings and Cena goes out to the announcers to talk some trash about Corbin. Corbin comes out but Cena goes back in. Fans do dueling chants now. They lock up and go at it. Cena starts with a headlock. Corbin ends up turning it around and beating Cena down as he talks trash. The referee warns Corbin and fans boo. Corbin dominates and hits a huge clothesline for a close 2 count. Corbin with more offense and some trash talking. Cena jumps up and looks to make a comeback but Corbin shuts him down for another 2 count. Corbin stands over Cena and yells at him. Corbin yells out at the crowd now. Corbin keeps Cena grounded. Corbin breaks the hold to talk trash to the fans. Cena comes back and hits a dropkick but Corbin shuts him down again. A “where’s your briefcase?” chant starts up. Cena ducks a clothesline and takes Corbin down with the shoulder tackle. Cena hits his signature moves for the comeback now. Cena calls for the Five Knuckle Shuffle but Corbin rolls out of the way. Corbin goes under the bottom rope and runs back in, catching Cena with a big chokeslam backbreaker for a 2 count. They end up on the second rope for a test of strength. Cena headbutts Corbin to the mat. Cena hits a tornado DDT. Cena calls for another Five Knuckle Shuffle and hits it this time. Corbin gets up and Cena scoops him for the Attitude Adjustment but Corbin counters and hits Deep Six for a 2 count. More back and forth between the two. Corbin continues to aggressively beat Cena around. Corbin tries to run out and back in again but Cena floors him with a big clothesline. Cena goes on and hits an Attitude Adjustment for the win. – After the match, Cena’s music hits as he stands tall. We go to replays. We come back to Cena greeting some special guests that are sitting behind the announcers. Cena also stops and hugs Betty Skaaland, widow to WWE Hall of Famer Arnold Skaaland. Cena makes his exit. Back from a break and out comes Natalya first. SmackDown Women’s Champion Naomi is out next as Greg Hamilton does formal ring introductions. The bell rings and they go at it. Natalya with offense early on but Naomi jumps up and runs her over. Naomi runs and slides on her knees, smacking Natalya in the face. Natalya goes to the floor for a breather. Naomi ends up hitting a Blockbuster from the steel steps. The referee counts as we get a replay of the Blockbuster. They come back in and Naomi sells a leg injury. Natalya catapults Naomi from the apron into the steel of the turnbuckle. Naomi falls to the floor and Natalya stands tall in the ring. Natalya goes back to the floor and works Naomi over as the referee counts. Natalya brings it back into the ring and keeps control. Natalya slams Naomi by her head and stands tall. Natalya stomps away in the corner. We see Carmella and James Ellsworth watching backstage. Natalya with more offense and a pin attempt. Natalya laughs as she has her way with Naomi. Naomi comes back with kicks but Natalya overpowers and slams her for another 2 count. Natalya tells the crowd to shut up and keeps control of Naomi. Natalya with an abdominal stretch now. Natalya ends up hitting a big discus clothesline for a 2 count. Naomi finally fights back after creating an opening. Natalya goes for another discus but Naomi drops her with a kick. Naomi drops Natalya on her face and covers for a 2 count. More back and forth now. Naomi slingshots in with a big leg drop for a 2 count. Natalya ends up getting the Sharpshooter locked after they trade holds. Naomi breaks it. Naomi with more offense but Natalya gets another Sharpshooter locked. Naomi taps and Natalya gets the title. – After the match, Natalya takes the title and celebrates. We go to replays. We come back to Natalya taunting an emotional Naomi with the title. Natalya makes her exit and raises the title high. Back from a break and we see the shark cage in the middle of the ring. Out comes Enzo Amore. He cuts a promo and speaks for a few minutes until the music interrupts and out comes Big Cass. Enzo is placed into the shark cage and raised above the ring. Big Show is out next. Show takes Cass to the corner and works him over. Show sells the arm injury angle and switches to his left hand to beat Cass down. Enzo cheers on Show from the shark cage. Show keeps up the attack on Cass, delivering a big chop in the corner. Enzo continue to run his mouth as Show works Cass around the ring. Show delivers a side slam but comes down hard on his bad hand. Show keeps control and goes to the corner for a Vader Bomb but he’s slow due to the cast on his hand. Show moves the bomb as Cass rolls out of the way. Cass charges but Show barely hits a knockout punch for a 2 count. Cass ends up making a comeback by targeting the injured hand. Cass stomps on the hand and stalks Show around the ring. Cass applies an armbar now. Cass keeps control and it sounds like fans might be chanting “boring” at the match. Cass stands tall but fans boo him. Show goes back to using his left hand and turns it around. Show goes on and manages to hit a big chokeslam but Cass still kicks out at 2. Cass goes to the floor as Show recovers. Show tries to pull Cass back in the ring but Cass fights back, slamming the injured hand into the ring post. Cass fights back into the ring as Enzo starts trying to escape from the shark cage. Enzo takes off his pants and hopes that he will be able to fit between the bars now. Cass continues working Show over. Enzo is oiling himself up now. Cass looks up and sees that Enzo has made it out of the cage now. Enzo drops down to the ring but Cass immediately floors him with a big boot. Cass waits for Show and nails him with a big boot but Show manages to kick out at 2. Show gets up but Cass hits him with another big boot. Cass drops the Empire Elbow for the pin. – After the match, Cass stands tall as his music plays. Cass talks trash to the crowd and stands tall as we see Show and Enzo down on the mat. – RAW General Manager Kurt Angle is backstage when SmackDown General Manager Daniel Bryan walks in. Bryan believes the blue brand will steal the show tonight. He touts the WWE Title match but Bryan says the WWE Universal Title match will be epic. Bryan says not as epic as what SmackDown will present and that’s true, it’s damn true. Angle does a “yes!” chant after asking if RAW will have the better matches. Bryan chants “no!” as Angle chants “yes!” back and forth at each other. We go back to the ring and out comes Randy Orton. Orton poses in the corner but here comes Rusev from behind. Rusev attacks Orton and takes him outside, launching him into the barrier. Rusev destroys Orton and brings it back into the ring. The referee checks on Orton and Rusev waits. Orton is slow to get to his feet but he gets up and the bell rings. Rusev charges at Orton but Orton immediately catches him in the RKO for the squash win. – After the match, Orton recovers as his music hits. Orton poses in the corner while Rusev is down on the mat. We go to replays. We come back to Orton posing as Rusev recovers. – We see Sasha Banks backstage walking. Bayley approaches her, gives her a hug and wishes her good luck. Some fans in the arena boo Bayley. – The announcers lead us to a video package for the next match. We go to the ring and out comes Bray Wyatt. The lights go out and the graphics turn red as we hear someone start singing “In His Hands” in the arena. The grand entrance begins as Finn Balor comes out with his Demon King gimmick, paint and all. Balor creeps into the ring as Wyatt looks on from ringside. Wyatt goes to the floor early on and the referee counts. Wyatt comes back in and they go to lock up but Wyatt smacks Balor. Balor stares him down and goes to work with kicks and punches. Finn keeps control and drops Wyatt with quick strikes. Wyatt goes to the floor but Balor runs around the ring and knocks him down. Balor brings it back into the ring as fans chant his name. Wyatt turns upside down in the corner and taunts Balor. Balor comes right back and takes Wyatt down, hitting him with more kicks. Balor ends up launching himself over the top, taking Wyatt down as Balor continues to dominate. Balor looks to go up for a Coup de Grace but Wyatt turns it around from the floor. Wyatt hits a suplex to the floor. The referee counts as they go at it on the floor. Wyatt rolls Balor back into the ring and keeps control. Wyatt drives Balor’s shoulder to the mat from the top. Wyatt with a knee to the spine before keeping Balor grounded. Wyatt sends Balor into the corner and goes for Sister Abigail but it’s blocked. Balor drops Wyatt and nails the stomp to the chest. Wyatt runs into boots in the corner. Balor drops Wyatt with an overhead kick. They run the ropes and Balor keeps control. Wyatt goes to the floor and Balor dropkicks him from the apron. Balor with a big running kick to the face from the apron. The referee counts Wyatt now. Balor nails a big stomp from the apron to the back of the neck on the floor. Balor brings it back into the ring and goes to the top. Balor has to roll through. Balor counters Sister Abigail again. Balor with a Slingblade. Balor charges but Wyatt kicks him in the face. Wyatt plants Balor into the mat for another 2 count. Wyatt with more offense and a running senton for a 2 count. Balor comes back and slams Wyatt for an elbow to the chest. Wyatt kicks out at 2. Wyatt goes back to the floor for a breather. Balor charges and kicks Wyatt into the barrier. Balor brings it back into the ring and waits. Wyatt nails a big clothesline instead but Balor kicks out at 2. Wyatt turns upside down again but it does nothing to Balor. Balor stares him down. Balor with a Slingblade and a corner dropkick. Balor goes back to the top and hits Coup de Grace for the win. – After the match, Balor crawls over and stares at Wyatt before standing tall as his music hits. We get replays as Balor does his exit. – We get a video for the next match. We go to the ring and out first comes RAW Tag Team Champions Cesaro and Sheamus. Seth Rollins is out first for his team, wearing new red and black gear. Dean Ambrose is out next. Ambrose starts things off with Cesaro and they go at it. Sheamus tags in after a quick tangle. Ambrose and Sheamus lock up. Sheamus takes Ambrose down. More back and forth now. Rollins comes in but Cesaro tags in and they double team him in the corner. Ambrose tags in and they double team Cesaro now. Ambrose with a 1 count. Cesaro unloads on Ambrose bu Ambrose knees him in the gut. Rollins tags in for more nice double teaming on Cesaro. Sheamus comes in but they double team him as well. Ambrose and Rollins clear the ring and stand tall. Sheamus and Cesaro regroup on the floor. Cesaro sends Ambrose to the floor, allowing Sheamus to floor Ambrose with a Brogue Kick on the floor. Rollins sends Cesaro out. Rollins runs the ropes for a dive but the champs catch him and launch him onto the floor. The champs bring it back into the ring and work Rollins over. Rollins finally turns it around but Ambrose is still down on the floor from the Brogue Kick. Sheamus grabs Rollins and hits a suplex for a 2 count. There’s a beach ball being thrown around the arena, causing Cesaro to run into the crowd and rip the ball up. The crowd goes wild. Cesaro comes back and tags in with a suplex on Rollins for another 2 count. Sheamus tags back in. Ambrose finally comes back to the apron. Rollins ends up sending Cesaro to the floor. Cesaro lands hard and sells a knee injury. Sheamus tags in and stops Rollins from tagging. Sheamus goes for a cheap shot but Ambrose avoids it. Rollins gets double teamed on the floor now. Ambrose goes to the top and nails a big elbow on all three of the other Superstars as they double teamed Rollins. Ambrose finally gets the tag and unloads on Cesaro. Ambrose also gets a shot in on Sheamus. Cesaro rolls Ambrose up for 2. Ambrose with a swinging neckbreaker. More back and forth until Ambrose and Rollins clear the ring. They run the ropes and nail a pair of suicide dives on their opponents. Rollins nails a Slingblade in the ring on Cesaro as Ambrose holds Cesaro. Cesaro kicks out at 2. More back and forth now. Ambrose blocks a Neutralizer from Cesaro. Ambrose and Cesaro go at it. Sheamus ends up on top but they double team him. Ambrose nails a superplex. Rollins follows up with a Frogsplash to Sheamus but Cesaro breaks the pin. Sheamus ends up fighting off a double team. They turn it around and beat him down in the corner. Rollins and Ambrose stand tall. They take Sheamus to the second rope for a Shield-style powerbomb. Cesaro runs in and they drop Sheamus without hitting it. Sheamus rolls Ambrose up for 2. Sheamus with a tilt-a-whirl slam on Ambrose for a 2 count. Cesaro with a cross-body from the top on Ambrose but he can’t get the pin. Cesaro blocks Dirty Deeds and hits the Cesaro Swing. Cesaro applies the Sharpshooter next. Cesaro tightens the hold and pulls Ambrose away from the rope. Sheamus with a rolling senton to Rollins on the floor. Cesaro stops a counter and keeps Ambrose down, transitioning into a Crossface submission. It’s finally broken. Sheamus with a cheap shot to Ambrose. Sheamus tags in for a double team clothesline out of the corner. Sheamus covers for a close 2 count. Cesaro tags in and hit a double Celtic Cross but Cesaro’s pin is broken by Rollins running in. Sheamus and Cesaro stomp away on Rollins now. They dump Rollins to the floor. Ambrose sits up on his knees and tells them to bring it. Cesaro attacks Ambrose and unloads. Sheamus joins in. Sheamus and Cesaro go for an assisted White Noise but Rollins comes in with a hurricanrana to Cesaro from the top, sending him into Sheamus. Rollins superkicks Cesaro. Rollins with big shots to Sheamus in the middle of the ring, a superkick and a jumping knee. Ambrose nails Dirty Deeds on Sheamus for the win and the titles. – After the match, Rollins and Ambrose celebrate and embrace in the middle of the ring. We go to replays. We come back to the former Shield members celebrating with the titles as Sheamus and Cesaro look on from the ramp. Rollins and Ambrose bump fists before going back to the corners to pose. Back to the ring and out comes Shane McMahon to serve as the special referee. Kevin Owens is out next, followed by WWE United States Champion AJ Styles. AJ attacks Owens before the bell as Shane tries to stop it. Owens fires back and they brawl. Shane breaks it up and we get the bell. AJ takes control early on and hits a nice kick to the face from the apron to the floor. Owens brings it back in and beats AJ down, yelling about being the man. AJ comes back with a backbreaker. More back and forth action. Owens with a shot to the throat coming out of the corner. Owens goes on and hits a big clothesline. Owens with more strikes and trash talking. Owens with chops in the corner now. Owens keeps control and hits a corner cannonball for a close 2 count. Owens hits a senton and keeps AJ grounded on the mat, still talking trash. They get up and Owens keeps control but AJ tells him to bring it. Heavy back and forth now. AJ nails a Facebuster on Owens. Owens blocks a Styles Clash and backdrops AJ. AJ goes for a moonsault but lands on his feet. Owens with a big superkick. AJ blocks a pop-up powerbomb and hits the fireman’s carry neckbreaker for a 2 count. AJ goes to the top but Owens cuts him off, possibly pushing Shane into him. Owens takes AJ up top and puts him on his shoulders but AJ slides out and hits the sunset flip powerbomb. AJ goes for the springboard inverted 450 but Shane gets caught in the crossfire as he was checking on Owens. They’re all down now. Owens nails a pop-up powerbomb but AJ kicks out at 2. Owens yells at Shane. Owens continues arguing with Shane as AJ recovers. They get in each other’s face. AJ ends up applying the Calf Crusher to Owens. Owens ends up kicking AJ into Shane. Shane gets sent out to the floor. AJ applies the Calf Crusher again but there is no referee. Shane is slow to get up on the floor. Owens is tapping but Shane is still on the floor. Shane comes back in and AJ argues with him. AJ puts his hands on Shane but gets shoved back. AJ charges but Owens sends him face first into the turnbuckle. AJ comes out of the corner and nails a forearm. Owens launches AJ into the corner with a suplex. They end up on the top again, trading positions. Owens drives Owens AJ into the mat with a suplex but AJ still kicks out. They get up and trade shots in the middle of the ring. AJ ends up missing a pele kick but Owens hits a superkick. AJ stops a pop-up powerbomb. Styles goes on and nails the Styles Clash but Owens kicks out. Owens ends up getting a close pin on AJ as AJ got his foot on the bottom rope, leading to Owens and Shane arguing. Owens puts his finger in Shane’s face and backs him into the corner. Owens jabs his finger at Shane. Shane warns Owens and does the same. Owens warns Shane not to touch him. Owens shoves Shane. Shane shoves him back into a roll-up from AJ for a 2 count. AJ nails a pele kick and Owens is stunned. AJ goes on and springboards in with the Phenomenal Forearm and Owens goes down. AJ with a Styles Clash in the middle of the ring for the pin. – After the match, AJ takes the title and stands tall as Shane raises his arm. AJ walks around with the title as we go to replays. – We get a video package for tonight’s WWE Title match. We go to the ring as violinist Lee England Jr. begins performing to assist with Shinsuke Nakamura’s special entrance. The Singh Brothers appear on the stage next before WWE Champion Jinder Mahal makes his entrance. Some of the other international announce teams were shown earlier in the arena, and now we check in with the Indian announce team. We get formal ring introductions from Hamilton. Back and forth to start as they size each other up. They do a test of strength and Jinder applies a headlock. Nakamura ends up telling Jinder to bring it, then tossing Jinder to the floor. The Singh Brothers check on Jinder. He tries to get back into the ring but Nakamura kicks him back out. A “3MB” chant starts up next. We check in with the Japanese announce team next. Jinder finally makes it back in and turns it around. Nakamura drops him and nails a knee drop as fans hum Nakamura’s theme. They end up on the floor and The Singh Brothers send Nakamura into the barrier. Jinder does the same and brings it back into the ring. Jinder unloads on Nakamura as the referee warns him. Jinder keeps Nakamura grounded now. Fans chant for Nakamura but Jinder mocks him. Jinder drops Nakamura again and continues working him over. Jinder grounds Nakamura again now. Nakamura comes back with strikes. Nakamura unloads with kicks while Jinder is on his knees. More back and forth. Jinder blocks the exploder suplex. Nakamura catches Jinder in the armbar. Jinder gets his foot on the bottom rope to break it. They tangle and trade counters before Nakamura plants Jinder on his face. Jinder ends up rolling Nakamura up for 2. Jinder comes back and hits a knee for a 2 count. Jinder calls for The Khallas but it’s blocked. Nakamura decks him but Jinder is still up. Jinder charges but Shinsuke moves and he hits the ring post. Nakamura keeps control and sends Jinder to the mat. Samir Singh gets on the apron and Nakamura pulls him in. Sunil Singh also gets hit by Nakamura. Nakamura focuses on the brothers, allowing Jinder to come from behind and hit The Khallas for the win. – After the match, Jinder takes his title and heads for the ramp as some fans look shocked. Nakamura is flat on his back as we go to replays. The Modern Day Maharaja raises the WWE Title on the stage as Nakamura looks up from the ring. – We return from a break and the RAW announcers lead us to a video package for tonight’s main event. Back to the ring and out first comes Braun Strowman to a pop for tonight’s main event. Samoa Joe is out next as fans chant his name. The boos start up before Roman Reigns even makes his entrance but out he comes to a loud mixed reaction. WWE Universal Champion Brock Lesnar is out last with Paul Heyman as fans pop. We get formal ring introductions from JoJo. Heyman interrupts JoJo and does the grand introduction for his client. The bell rings and Joe attacks Lesnar, Braun attacks Reigns. Braun tosses Reigns to the floor and follows. Joe and Lesnar take turns in the corner. Lesnar with a belly-to-belly suplex that sends Joe out to the floor. Reigns sends Braun into the steel ring post. Reigns stares at Lesnar. Lesnar tells him to bring it. Reigns enters the ring and Lesnar laughs. Reigns charges and Lesnar catches him in a German suplex. Joe runs in and Lesnar hits him with a German suplex. Lesnar stands tall. Braun steps up to the apron and fans pop as he stares Lesnar down. Lesnar waits as Braun talks trash and approaches him. Reigns runs in and attacks Lesnar. Joe runs in and attacks Braun. Lesnar works over Reigns while Braun takes Joe down. Lesnar and Braun clear the ring, then face off again. Fans pop. Lesnar charges but Braun sends him into the corner and splashes him. Braun clotheslines Lesnar over the top rope. Fans pop as Braun stands tall. Reigns comes in but Braun takes him out. Reigns sends Braun into the ring post and he goes to the floor. Joe applies the Coquina Clutch to Lesnar on the floor. Reigns charges but Joe sidesteps and Reigns spears Lesnar through the barrier. Braun drops Reigns at ringside and shoves Joe over the announce table. Fans chant “this is awesome” as Braun fights Lesnar off and scoops him. Braun powerslams Lesnar through an announce table for a big pop. Fans chant for Braun now. Reigns shuts him down. Joe runs the ropes and dives out onto Reigns, taking him down on the floor. Braun launches one of the announcer chairs at Reigns and Joe. Braun takes apart an announce table now. Lesnar stumbles to his feet. Braun scoops Lesnar and powerslams him through another announce table. Fans chant for another table. Braun goes over to another announce table and turns it over on Lesnar. Graves wonders if he just broke Lesnar’s legs. Heyman begs Braun to stop. Referees, officials and trainers are down to check on Lesnar and turn the table over off him. Fans chant “this is awesome” again. A stretcher is brought out by paramedics now. Heyman is losing his mind. Lesnar is strapped to a body board as we get a replay of the three table bumps Lesnar took from Braun. Fans sing “goodbye” as Lesnar is stretchered away. Braun yells at Lesnar. Braun scoops part of the steel steps and drives them into Joe’s face, then Reigns. Joe takes another steps shot to the face. Braun tosses the steps into the ring. Braun rolls Reigns into the ring. Reigns decks him. Fans boo as Reigns turns it around on Braun. Reigns grabs the steps and hits Braun with them. Reigns with another steps shot to the head. A third shot with the steps knocks Braun out of the ring. Joe comes from behind and rolls Reigns up for a close 2 count. Joe with an inverted atomic drop and a senton for a 2 count on Reigns. Reigns blocks the Uranage and hits a Samoan Drop for a 2 count on Joe. Joe blocks a Superman punch and goes for the Coquina Clutch. Braun comes in and ends up hitting a chokeslam on Reigns for a 2 count. We see that Braun is busted open on his head now. Lesnar starts marching back to the ring. He faces off with Braun, tackles him and unloads with hammer fists. Lesnar rocks Braun and sends him out of the ring. Reigns comes in but Lesnar nails a German on him. Joe rushes but Lesnar hits him with another German. Braun comes in and scoops Lesnar but Lesnar counters. Lesnar tries for a German but Braun fights it. Braun elbows Lesnar. Braun grabs Lesnar but Lesnar tries for the Kimura Lock. Reigns runs over and hits a Superman punch, breaking Braun’s hold on Lesnar. Reigns with two more Superman punches on Lesnar as fans boo. Reigns hits a spear on Lesnar for a 2 count. Reigns gets up but Joe applies the Coquina Clutch. Braun breaks it with a dropkick. Braun powerslams Joe and covers for the pin but Lesnar pulls the referee out to the floor. Reigns with a Superman punch on Lesnar on the floor. Reigns comes in and counters Braun with a Superman punch. Reigns with a 2 count as Braun powers up. Reigns charges for a spear but Braun boots him. Braun with a powerslam on Reigns for a 2 count as Lesnar breaks it up. Fans chant “this is awesome” again. Everyone is down but Braun gets up first. Braun grabs Lesnar but Lesnar powers up for a F5. Braun counters it. Reigns spears Lesnar and Braun at the same time as Braun is looking to powerslam Lesnar. Lesnar scoops Reigns for the F5 but Joe makes the save. Joe sends Reigns to the floor and applies the Coquina Clutch on Lesnar in the middle of the ring. Lesnar breaks the hold and hits the F5 on Joe for a close 2 count as Reigns makes the save. Reigns waits for Lesnar to get up and nails a Superman punch but Lesnar is still up. Reigns hits another Superman punch. Lesnar goes down after a third punch. Reigns waits for Lesnar again. Lesnar catches Reigns in mid-air and nails the F5 for the pin. – After the match, Lesnar takes the title and joins Heyman at ringside. Braun is down at ringside. Lesnar falls down on the floor and clutches the title as Heyman checks on him. We go to replays. We come back to Lesnar still down clutching the title. Reigns is on his back in the ring. Lesnar slowly gets to his feet and stands tall. Joe is also trying to get up. Heyman raises Lesnar’s arm and they laugh while looking back at the ring as SummerSlam goes off the air.